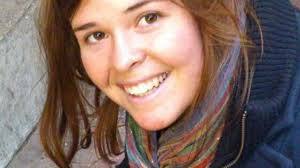 The world was saddened Tuesday with news of the death of young Kayla Mueller, an American aid worker who was taken hostage more than a year ago by Islamic State terrorists. Kayla’s young, smiling face has been gracing the covers of newspapers and online news feeds since the tragedy was made public. By most accounts, Kayla Mueller led a life defined by service to others. She went into poor and war-torn areas to give aid and comfort to those suffering, whether it be from wartime displacement, AIDS, hunger, abuse, or neglect. If Kayla were Catholic, she might one day be a candidate for sainthood. Certainly, most Christians would call her “blessed.” In Jesus’ Sermon on the Mount, he describes the qualifications for blessedness. “Blessed are the poor in spirit.” Kayla recognized her helplessness and relied on God. “Blessed are those who mourn.” Kayla suffered primarily by worrying about the anguish her captivity was causing her family. “Blessed are the meek.” Kayla sought work in the most unglamorous locations in the world. Most of us would never have heard of her had she not been killed. “Blessed are the merciful.” Kayla ministered to the sick and downtrodden. “Blessed are the peacemakers.” Even in captivity, she tried winning over her captors and teaching them crafts. “Blessed are the pure in heart.” Aside from some hateful naysayers, most of us would agree that her heart was as big as an ocean. How else to explain her contention, while being held hostage, that “there is good in any situation”? “Blessed are those who are persecuted because of righteousness.” There is a strange irony in the fact that Kayla was helping Syrian refugees when abducted by ISIS. A favorite hymn of mine has the words, “And they’ll know we are Christians by our love.” I can’t help but hope that at least some of Kayla’s captors will be transformed by her self-sacrificing love and move away from violence and hate, toward peace.